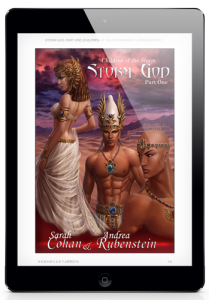 Storm God: Part One on sale now! From her earliest memory Adrienne Taylor has had recurring dreams of Set, the ancient Egyptian God of Chaos. While excavating a temple in Dharai, Egypt for the Obelisk Corporation, her visions lead her to the fragments of a tablet that contains an ancient prophecy. Her discovery takes her from Egypt to Brazil, where she discovers the ancient culture of the past yet lives on and she becomes the unwanted guest of a present day Pharaoh and his queen. Adrienne’s presence in the palace sets into motion a chain of events that can only end with the revival of Set or his eternal banishment. With the cult of Osiris trying to stop them at every turn and time running out, Adrienne and Queen Tia-Sitset must forge an uneasy alliance before they become the latest victims of the gods’ vengeful schemes.